Xtremlive provides the ability to capture RAW uncompressed HD and SD and a processing system that allows you to shoot in real-time multi-format video and audio Direct-to-Disk with encoding capabilities. It offers real-time broadcast proxies to air, live-edit during the shoot, and the ability to broadcast content over the network or delay playback. Xtremlive also gives you the ability to encode your proxy video into QuickTime, Flash, MPEG, and more formats all in real-time, saving you time and effort, without any limitation to the number of simultaneous real-time video encodes and retaining all the EDL information. 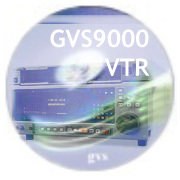 The above proxy files generate from GVS9000 VTR and broadcast live over the web for real-time preview. The original file is recorded on GVS90001XU VTR HD and is saved on redundant drives so one drive stays in the VTR and a mirror HD drive gets shipped to the post production facility. The proxy can be saved onto removable media, or onto shared network storage as well as broadcast live on the web. - Ability to record a picture into AVI/Cineon/DPX/JPEG/IMX/QuickTime/MXF/Windows movie, with content available during recording or immediately after recording is completed. - During live event EDL infomation can be entered on the fly for instant import to Final Cut Pro, Avid or Adobe Premiere. - LTC timecode or 9-pin timecode stamp , as selected in the menu control video option. GVS Xtremlive capture and processing system allows you to add real-time multi-format video and audio encoding capabilities to your existing workflow over SDI or interfaces built in.With Xtremlive Live you will be able to address any target platform with the highest quality video possible. It will not matter if the target is a network attached Microsoft Windows PC, Linux, or Mac, a set top box running on broadband, or a wireless PDA running a proprietary OS. Xtremlive can encode to all of the formats and bitrates necessary to reach all of these devices and it does so with the highest quality video and audio possible. The Xtremlive System (XLS) uses a very advanced form of temporal noise processing called motion adaptive 3D noise reduction. Motion adaptive 3D noise reduction combines the information in multiple frames of video on a pixel by pixel basis to decide how much processing is applied to each pixel in the final frame. Because each pixel is calculated individually the result will be more precise noise reduction with less motion blurring artifacts than would otherwise be normally possible, or going with highest quality of RAW pixel to pixel accurate frame by frame uncompressed media. The secret to Xtremlive Proxy encoding capabilities is our high quality Media Processing Engine (MPE) - our combination of video and audio preprocessing filters that run in GVS9000 VTR hardware and software in real-time. The Xtremlive System is available in a custom configurations ranging from single channel analog to dual channel digital SDI (video and audio) 2K, 4:4:4 to 4:2:2. Our most powerful solution, the Xtremlive high-end system, features two channels of advanced video processing capabilities and up to 8 channels of audio processing. Each video channel consists of powerful features such as motion adaptive de-interlacing and 3D noise reduction. Powerful video preprocessing means that you can deliver higher quality, higher resolution, progressive scan video that makes more efficient use of bandwidth than video created using competing systems. Each audio processing engine features dual 7-band parametric EQ and dynamic range compression/expansion to make sure your message gets through loud and clear. The Xtremlive option for GVS9000 VTR gives you one simple, consistent interface that leads you through simple steps to creating multiple encode proxy formats. With just simple clicks it allows you to deliver your proxy content anywhere in the world in real-time.